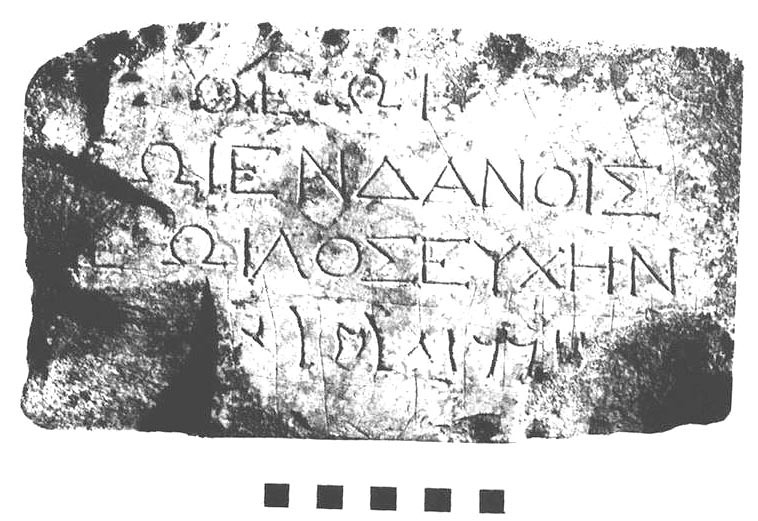 This report was prepared in fulfillment of a request to examine the Zoilos Inscription. This is a report, not an article; hence, it contains neither the extensive expansions and explanations nor citations that will appear in the article currently in preparation and which is based upon this report. The Zoilos votive inscription was unearthed by archaeologists at the Tel-Dan site inside the sacred precinct and only 17 meters from the remains of a ninth-century BCE building of ashlar construction. The artifact was found lying face down under the floor of much later structure from the Hellenistic period. The inscription is written in both Greek and Hebrew, with three lines of Greek text on top and one line of Hebrew on the bottom. This is not a bilingual inscription: the text of the Hebrew is not a translation of the Greek and there is no line or space dividing the Greek from the Hebrew text. The text is professionally inscribed with a chisel on a limestone tablet 3.2 cm (1-1/4") in depth, 25.6 cm (ca. 10-1/4") in width, and 18.2 cm (ca. 7-1/8") in height. As most ancient inscriptions, the text is damaged. While the exact wording of thetext is important, ancient documents contain more than words. This inscription gives us a great deal of ancillary information. 1) The stone writing surface states that the document was a legally binding covenant. Outside of official texts, such as law codes or legal rights or "victory" stelae, only archival or legally binding documents were carved in stone. Writing systems are very conservative; the distinction in treatment between official and/or archival documents and the general run of texts datesback to Sumer. Clay is a friable material when dry. At Sumer, official and archival documents were baked while lesser texts were only sun-dried. This baking served two purposes: it changed the friable material into a permanent one and it prevented any change in the wording of a document. Later, documents of legal import were carved in stone. 2) The format is the standard block format employed to protect the integrity of the written words. This format dates back to the origins of writing. While the block format facilitates fast reading (the even right-hand margin on a justified text behaves like a picture frame to keep the eye within the text area), protection of the written text is the paramount reason behind those neat blocks of texts, whether on clay, stone, parchment or papyrus. It is also the reason why we can determine the approximate number of missing graphs on a damaged document. 3) The size is the rotatable size used for legal documents of the second class in the Greco-Egyptian hierarchy of sizes. Once again, hierarchies of sizes date back to the beginnings of writing. In this case, though, the hierarchies differ depending upon which side of the ANE a document is from. This difference came about because of the differences between the writing materials. On the Semitic side, The Law is always the largest document in height -- 14" to 15" inches high by 7" to 8" wide. As clay, stone, and leather are a) cheap, b) readily available, and c) can always be found or prepared in the appropriate sizes, the Semitic hierarchy did not change over time, and was used under the Seleucids as well. On the Egyptian side, however, they wrote on papyrus. Further, papyrus is cut from a roll as needed in the size appropriate to the type of document and in accord with the Greco-Egyptian hierarchies. Under the Greeks, and later the Romans, a typical tax receipt, for example, was 6" high by 3" wide. Local scribes could (and they did) cut three such receipts out of a roll 9" in height. Two of these receipts would be 6" x 3", the one cut across the bottom would be 3" x 6" -- and all three would be considered the same and correct size. In the Greco-Egyptian hierarchy of sizes legal, but not official, documents were approximately 10" in width by 7 to 7- 1/2" in height -- OR -- 10" in height by 7 to 7-1/2" in width; the direction did not matter and the size meant the same thing. As under the Seleucids the document would always be higher than it is wide, the Zoilos inscription was written at a site using the Greco-Egyptian hierarchy of sizes. The size of the inscription, therefore, supplies concrete evidence that the site was under Ptolemaic control. 4) The shape indicates that the inscription was meant to be placed on a wall or stele for public display. It was standard practice in antiquity to affix a document of legal significance on a wall or stele. These displays were packed in, one tablet next to the other both above and below as well as to the sides if the display were on a wall. Apparently whoever operated the site stuck vows up for display as, even though the tablet has been damaged, its burial under the floor protected it well enough to see that the limestone was carefully prepared and dressed and the shape is designed to "pack." 5) The professionally executed inscription tells us that the site was busy enough to retain a professional stone carver on hand. Carving inscriptions on stone is a highly trained skill that can not be learned overnight or performed by just anybody. 6) The presence of a professional stone carver tells us that tablets in the correct size were prepared in advance ready for use. We should not be too surprised at this "mass production" aspect. Mass production techniques have been around for thousands of years, the only difference between then and now is the means of implementation. There are good reasons why we still refer to "manpower." The Greeks did quite a bit of mass production. Approximately 6 years ago, a group of votive inscriptions dated to the 6th-5th centuries BCE were found in a cave on Parnassus. These votive offerings consist of two types (with or without "ears") of mass produced cups. The inscriptions are scratched onto the outside; the hands vary in execution from clearly literate individuals to semi-literate (at best). (These items are on display at the Archaeological museum in Athens; however, they are in the process of being written up for publication and are surrounded by please do not photograph signs.) The Greeks had vase factories. A 2nd- century BCE white-ware vase factory was unearthed while extending the subway system. The vases in different sizes stood around in groups at different parts of the factory and in different stages of production: Each group of vases were at the same stage of production. (These white-ware vases are also being written up). They had statue factories where popular statues were copied. One statue of a mourning woman by a Greek master of the 4th BCE was particularly popular for funerary use both in Greece and later in Rome. It was available in five sizes. The mass production, ready-made business in Hellenic Greece was brisk. 7) The lack of a dividing line or space between the Greek and Hebrew texts states that this is not a bilingual inscription, that is, the text of the Hebrew is not a translation of the Greek text. Bilingual texts always have some type of separation between languages. The Greek/Aramaic bilingual stele found at Armazi, for example, has the last word in Greek centered and by itself in the middle of the block; the Aramaic begins after this dividing space. Bilinguals always have authoritative language on top, but the Zoilos tablet is not a bilingual inscription. There is another reason for the Greek on top. 8) The Greek text, as the language of officialdom and of the site, is inscribed in a formal, authoritative monumental script; the Hebrew is inscribed in a cursive square letter. The Greek text is a standard votive formula. Equally standardized, so as to fit with appropriate guard margins onto the pre-cut tablets, the text fits into three lines with the fourth line left blank to state what was vowed. The text would be written by a scribe (not the stone carver) directly onto the limestone block. In line one, "theoi name" would have been widely spaced to form a centered offset block on the top line; it would start where the theta is written. Line one is very oddly spaced, but the theta/epsilon give us the normal spacing. It is clear that the scribe filling in the information was told that there was no name for the god only after he had already written down the first two letters. The block format requires that no room be left for an insertion; obviously, situations arose when this could not be done and one word would be spaced out and centered (as on the Armazi stele). The theta/epsilon were too far to the left, so the scribe did what he could to center the remaining letters: omega iota. Clearly line two (TOI EN [site name]) had been written so many times that the scribe who wrote the text had no difficulty at all in placing the graphs correctly. On line three, however, the scribe apparently assumed that the personal name would be shorter than a typical Greek name and started out by allowing too much space (kerning) between the Zeta and the Omega in 'Zoilos'. He then had to squeeze in the rest of the name and complete the formula, but he had not allowed enough room, hence the 'Nu' of EYXEN overran the line breaking the formal block. Zoilos, appears to have been literate and accustomed to the block requirement. He lines his handwritten text up with the right hand side of the block. Instead of being written in Greek, the fourth line is in Hebrew. While it is impossible without a substantial body of text to determine whether a text is written in Aramaic or Aramaicized Hebrew, there is no question here as to the language. This line states in good, standard Hebrew, the formula for the oath of affirmation affixed at the end of a covenant. We know this was a covenant affirmation oath because NDR -- a legally binding vow -- is used as opposed to other types of vows. This fourth line was written by Zoilos himself, probably in ink, and then carved as Zoilos had written it by the professional carver. There appears to have been a flaw in the surface where Zoilos wrote his samech. While he had a decided tilt to his handwriting, he clearly was accustomed to writing. His graphs hang from an invisible line with the lameds correctly lined up at the bottom with the rest of the descender graphs and jutting out above the "line." We can expect variations, though, in an individual's handwriting. As the Hebrew does not translate the Greek, the Zoilos tablet is not a bilingual inscription. 9) A document carved in stone can only be nullified by either breaking the tablets, the most famous instance of this being Moses destroying the first set of Laws, or by chipping away the data. In this case, the limestone tablet was not broken and the damage to the text of this inscription is not due to age. Portions of this text have been selectively and intentionally destroyed, thus nullifying the vow. There are clear chisel marks on the Tau of "TOI" (in the second line) which show that whoever performed the cancellation at first attempted to efface the entire inscription. It is also clearthat the person implementing the cancellation gave up total effacement after working on the Zeta of 'Zoilos' as much too difficult and time consuming. Instead, as the Greek portion does not contain what was vowed, it has been "crossed out" by lines scratched through the text. The Hebrew, which did contain both affirmation oath and what was vowed, has the first and last words deliberately chipped away. All that remains of the first word is a small part of a final nun. In the Greco-Roman-Egypto tradition, gods had so many shrines about that the site name was necessary. The first word was unlikely to be 'BDN' as in the Hebrew tradition the site name is not required unless the contract is within a local context, such as the sale or transfer of real estate. Further, if the site name were of import, the site name in the Greek text [DANOIS] would gave been effaced instead of merely being "crossed out." Next, the choice of NDR shows that the document was a binding covenant. The first word was probably some affirmation, such as )HN or )MN, which accords with the choice of NDR. We shall never know exactly what Zoilos vowed he would not do: whoever destroyed that part of the text did a thorough job. We do not know who nullified the covenant. It could have been Zoilos or his heirs and assigns, who then buried the tablet under the floor of a building under construction. More likely, however, as the cancelled tablet was found within the sacred precinct, the vow was cancelled by someone affiliated with the site who was authorized to do so. The fact that the writing was face down accords with either possibility, but we can never know. In either case, however, the burial of the tablet protected it for more than 2,000 years. Because it was deliberately placed where it was found, it was found 'in situ'. Finally, The tablet gives us quite a bit of information about Zoilos. He was literate; we know that he could read Hebrew. As the oath itself was in Hebrew, but not in Greek, we know that Zoilos wrote Hebrew, as well; he did not necessarily write Greek. Because Zoilos used a formal Hebrew covenant oath formula, we know that he was a Jew. The person making the vow or oath would tell the name of the god as well as his own name to a scribe (not the stone carver; the carver did not write thetext) who would write the information down in the appropriate places for the carver to inscribe. Because, Zoilos did not give a name for the god, we know that he was unlikely to be a local and that he probably came from Judah where the god had no name. Wecan also know that the god of this inscription was the God of Israel. We moderns have one major problem dealing with older material; we are trained to ignore most of the data. We are taught that the text is all and that materials, size, script, and format are incidental and at the whim of a publisher or an author. As we still use hierarchies of material, size, format, and script, this idea is patently false; however, unlike the ancients, our recognition of these relationships is subconscious. The ancients were accustomed to a written object as a totality, be it a scroll, codex, stele, or votive inscription. If it were not for the material and the cuneiform, we could be looking at a modern cash register receipt -- which is designed much the same and for similar reasons. Writing an inscription and carving it were two different jobs. The scribe writing the inscriptions had to be literate; the stone carver, while requiring much skill, did not need to know how to read; he just carved according to the written graphs. An advertisement was found at Pompeii written by two enterprising individuals who had teamed up -- one to write the inscriptions, the other to carve them. We cannot know when a loan word was borrowed, we can only know when a loan word first appears. Nevertheless, it should be noted that NDR is not recorded in Aramaic texts until the second century CE.